Every diver is made aware of the dangers of decompression sickness (DCS), or "the bends" as it is more commonly referred to in the scuba diving community. It is one of the scariest possible outcomes of something going wrong on a dive and next to drowning and extreme cases of equipment failure, the most deadly. But the good news is with a solid understanding of what decompression sickness is, the symptoms and treatment protocols, you can drastically reduce the risk of getting bent. This can increase your confidence in your diving abilities and allow you to relax and enjoy your time under the waves. We hope this guide is helpful to the scuba diving community, please feel free to share it with your dive buddy. Understanding the causes and recognizing symptoms of DCS could help save someone's life! What Is The Bends? What Causes Decompression Sickness? Decompression sickness is caused when a diver ascends too quickly from depth and gas bubbles in the bloodstream expand quickly, which can cause some serious problems. As you dive, various gasses such as Nitrogen are dissolved into your bloodstream and body tissues. The air your are breathing is being compressed due to the increased surrounding pressure of diving at depth, the deeper you go, the more it is compressed, hence why deep dives are normally quite shorter than a shallow reef dive for recreational divers. The easiest example to illustrate what is happening is opening a twist top soda bottle. when it is fully sealed, all that liquid and gas is under pressure, but when you start to twist the top open, the pressure inside the bottle is released and you can start to see fizzy bubbles form in the otherwise still liquid and rise to the surface. Open the bottle in a slow, controlled manner and the rate of release is fine. Crank that lid off too fast however and the bottle could easily foam over in an explosion of fizz. This is similar to what can happen with the nitrogen in your blood if you ascend too quickly. A slow and controlled release of the gas is key here. Why is decompression sickness called the bends? Well, many of the symptoms can be felt in the joint areas of the body, elbows, knees etc. Basically areas of your body that bend. We will dive deeper (no pun intended) into the symptoms below. But first lets look at a few of the more unknown causes of the bends besides ascending to sea level too quickly. Altitude can play a major factor in causing decompression sickness, both diving in higher altitude sites like mountain freshwater lakes and also flying soon after diving. The lower surface air pressure on higher mountains can actually have quite a dramatic impact on decompression times and need to be taken into account. When it comes to flying, the rapid changes in altitude and pressure inside an airplane can play havoc on your body if there is still excess nitrogen left in your bloodstream. Should the pressure inside the cabin drop to lower than that at sea level, the last of that nitrogen that was under pressure enough to not be a problem at the surface could still expand and cause issues. This is why the rule of not flying within 48 hours your last dive needs to be taken seriously. With DCS, symptoms will almost always show up within 48 hours of surfacing from a dive. Some of the symptoms can show up within an hour, with most appearing 3-48 hours later. The most prominent symptom of decompression sickness pain in major joints such as the elbows and shoulders, but there are plenty more indicators something is wrong and you might have the bends. Some of the more common symptoms can be intense fatigue after a dive. 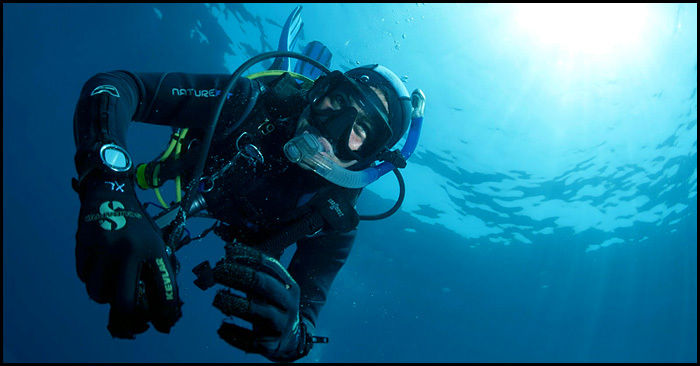 While some fatigue after a dive can be common in many divers due to the effects of breathing compressed air, intense fatigue could indicate the onset of DCS and be more serious. Especially if the amount of fatigue is disproportionate to the level of exertion from the dive. This can be accompanied by a feeling of weakness or numbness in your extremities such as your arms or legs, with the upper extremities being more common due to the way gasses can rise throughout the body while standing. Other common neurological problems caused by the bends can be dizziness, confusion, loss of consciousness, and problems with balance and general awareness. Another indicator of DCS is a blotchy rash that can be seen on the skin. This is cause by nitrogen bubbles expanding that are trapped under the surface of the skin, resulting in a red, discolored rash. The rash can be sometimes accompanied by an itching or tingling feeling depending on the severity. If you notice this rash appearing within 48 hours after a dive, be sure to alert a dive professional and get yourself to a hospital and tell them you might have decompression sickness. In addition to the more common pain in the major joints, pain in the head, neck or chest could indicate a more severe case of decompression sickness and be taken extremely seriously. There is also the possibility of a lung over expansion injury due to holding your breath while ascending, which is a big no no when it comes to scuba diving. If you have pain while breathing in, difficulty breathing, a cough or blue lips and skin this could be a sign of damage to the pulmonary system. You may also have pain and swelling in the lymph nodes as that is another area that can be effected by the bends. If you have any of the potential symptoms of decompression sickness, you need to immediately seek medical assistance, it is better to be safe than sorry. Every dive shop will know where the nearest hospital and decompression chamber facility is and will go out of their way to help you. You can also contact DAN (Divers Alert Network) from anywhere around the globe and they will be happy to assist you and any medical staff unfamiliar with DCS. We would highly recommend their diving insurance, the premium for a year is quite low and it can really save you in an emergency situation. Extreme Fatigue that is disproportionate to the physical exertion of the dive, vomiting. Pain in the major joints such as elbows and shoulders, or lower back. Can range from a minor tingle to feeling like they are on fire. Pain in the head, neck or torso can be an indicator of a more serious case of DCS. If you or someone in your dive group start showing symptoms of decompression sickness, or have an underwater emergency that requires an emergency or uncontrolled ascent it is imperative you take action right away. DO NOT re-descend to depth and attempt to do a safety stop or offgas underwater. There is chances of a diver losing consciousness due to air embolism or other symptoms and that can have deadly results, it's better to treat decompression sickness on the surface where there is less variables in play. The diver should be placed and remain in a horizontal position. By doing this you are reducing the risk of gas bubbles rising through the body to the neck, head and brain. This reduces the risk of an air embolism in the brain. If there is vomiting occurring, the diver should be placed on their side in the recovery position to avoid choking. Emergency oxygen should be provided as soon as possible. By breathing 100% pure oxygen you can greatly reduce the effects of the bends, by increasing the oxygen in the bloodstream you can help suppress the effects of nitrogen and other inert gasses. Every dive boat and dive center should be equipped with bottles of emergency oxygen that can be used to help divers with DCS as they are being transported to a medical facility for treatment and monitoring. Divers should be given fluids to decrease the chances of dehydration, which can increase the risk and symptoms of DCS. Another dive or part of the boat crew should take notes of anything that went wrong during the dive, the depth from which the accident or emergency ascent occurred and the length of the dive. The number of dives the effected diver has paticipated in that day should also be taken into account. All this information can help medical professionals diagnose and treat any potential case of DCS. In some extreme cases, medivac by helicopter might be required. When being transported it is recommended that the diver is kept horizontal at all times, even if they don't presently have symptoms. If air transport is required to reach a facility with hyperbaric treatment equipment, it is essential that the aircraft remain below 1000 ft of altitude unless the cabin can be pressurized to that of sea level. This is why helicopter transport is ideal in most long distance transport situations such as diving in the carribean where hyperbaric facilities are few and far between. Sometimes industrial/professional diving vessels with on board chambers have been known to offer their services if they are a closer option. Helicopter transport and hyperbaric treatment is extremely expensive, and this is why we always recommend even casual divers to have DAN insurance, it can literally save you hundreds of thousands of dollars should emergency treatment be required. A medical professional will be able to evaluate the severity of any potential decompression situation, and in some cases oxygen therapy might be enough to treat or offset potential symptoms. Even if it was a shallow dive and an emergency ascent occurs, divers should still be provided with emergency oxygen and monitored for symptoms up to 48 hours, even if none appear initially after surfacing. In more serious cases, upon being treated by a medical professional, hyperbaric treatment might be recommended as a precaution, or required due to the severity of the situation. If it is determined that hyperbaric treatment is required, the diver will be placed in a hyperbaric chamber which is pressurized to simulate the effects of diving at depth, and slowly the pressure is brought back to that at sea level, allowing the diver to offgass while breathing. The length of time spent in the hyperbaric chamber depends on the depth and length of the dive. It could be a couple hours for recreational divers, or even a day or more for technical divers or those working/living at depth for extended periods of time. There are quite a few things you can easily avoid and do to vastly decrease the chances of putting yourself in a situation where you would be at risk of getting "bent". Many of the things that increase your risk factor come into play before a dive even begins, so we will go through pre-dive precautions, things you can do during a dive to avoid the bends and also post dive things many divers don't take into account. With a little bit of effort, you can dramatically reduce the chances of ever having a bad experience and also boost your confidence in your own diving abilities! You should be well hydrated before a dive, dehydration can increase the risk of DCS symptoms like blood clots and fatigue, as well as muscle cramps. This is a big reason why it is not recommended to dive while hung over. A big night out before scuba diving the next day can leave your body dehydrated and not in optimal condition for physical exertion. We know the dive community loves to party in paradise but just use a bit of common sense and postpone the partying until after a great day of diving! Being overweight or having excess body fat can also increase your chances of experiencing decompression sickness. Nitrogen is dis-proportionally stored in fat stores compared to lean muscle mass, as much as 50% more. This means if you have a lot of excess body fat, more nitrogen can build up and be stored over the course of a dive, leading to a larger release upon surfacing. Being physically fit allows you to be more air efficient during a dive as well. All that effort at the gym pays off while scuba diving, think of it as an extra investment in the months before a big dive trip! You really need to plan your dives thoroughly, and dive with experienced divemasters who know the area well. Being familiar with changes in current or surge at a particular dive site can help you plan a fun dive that is within your experience and certification levels. Never attempt a dive that is beyond your current training or comfort zone. Know the exact depth of the dive and make sure all other divers within your group are familiar with any hazards or critical information before you get in the water. Finally, be sure to thoroughly test all your equipment on the surface before each dive. This is pretty standard operating procedure for most dive operators but it is easy to overlook something. Equipment failure during a dive can lead to an unexpected or emergency ascent, so double checking your scuba gear and knowing it is operating at 100% adds confidence once you descend and allows you to relax and enjoy the underwater world. Always thoroughly test your gear before each dive! During a dive it is important to remain close to your dive buddy. Losing track of your partner can lead to panic or confusion, which can lead to unintentionally ascending too rapidly, which leads to decompression sickness. It is also Important to stick close together in case of equipment failure. It is much better to breathe from your buddy's secondary regulator and both ascend in a slow controlled manner, than have to bolt to the surface should you run out of air or have another malfunction. It is also HIGHLY recommended to use a dive computer to keep track of the nitrogen levels accumulating in your body. Computers with a more conservative model are great at helping to ensure an adequate amount of nitrogen has left your system before you surface. Your computer will also warn you if you start to ascend too quickly or forget to make a safety stop. We have some great hands on reviews and recommendations of the best dive computers on the market if you want more info on that. We highly recommend using a dive computer on every dive! Finally, always be sure to ascend slowly at the end of a dive, and make a safety stop of at least 3 minutes, even on shorter or shallow reef dives. It is a simple precaution that takes little effort but can really pay off, especially when doing multiple dives in one day. Take some time to just chill and hang out below the surface and offgass while enjoying your surroundings. It's more fun to be underwater than on the boat anyways! If everything goes smoothly during your dive, you should be in the clear. Another awesome experience for the log book! By sticking to the plan and using a dive computer, you have brought the chances of experiencing decompression sickness down dramatically. By being aware of the symptoms of the bends, you can quickly identify them should you or another diver start to feel any of them, contact the dive center, DAN or the local medical facilities right away. Finally, like with any dive, be sure to thoroughly rinse all your gear, especially if diving in saltwater. It can be a hassle at the end of a long day of diving, but maintaining your scuba equipment can help it last so much longer and help avoid any failure due to corrosion or damage. After that, kick back on a beautiful beach and watch the sun go down. Just another day in paradise! Start the day by drinking fluids to be properly hydrated by dive time. Stick close to your dive buddy in case an emergency should occur. Use a dive computer to track your nitrogen levels, dive depth + time and follow the warnings. Do a safety stop at the end of every dive, 3 minutes minimum, 5 recommended. We really hope this article is helpful to anyone just starting out in their scuba diving adventure, or even to experienced vets of the dive community. It is not out intention to fear monger, but to educate divers on how with a few simple precautions, they can greatly reduce the risk of ever encountering decompression sickness. By observing proper dive procedures, remembering your training and always partnering with divers who have experience with the area, you can almost always guarantee yourself an awesome experience under the waves. Almost every sport has it's risks and dangers, but as any experienced scuba diver will probably tell you, getting the chance to explore the ocean far outweighs the potential downsides. Use common sense, proper gear and follow the guidelines set by PADI or other scuba diving organizations and you will be fine! Happy diving everyone!